Dramatic stormy clouds and harsh, contrasting lighting is commonplace to Florida weddings, with storms springing up out of nowhere in the spring and summer. 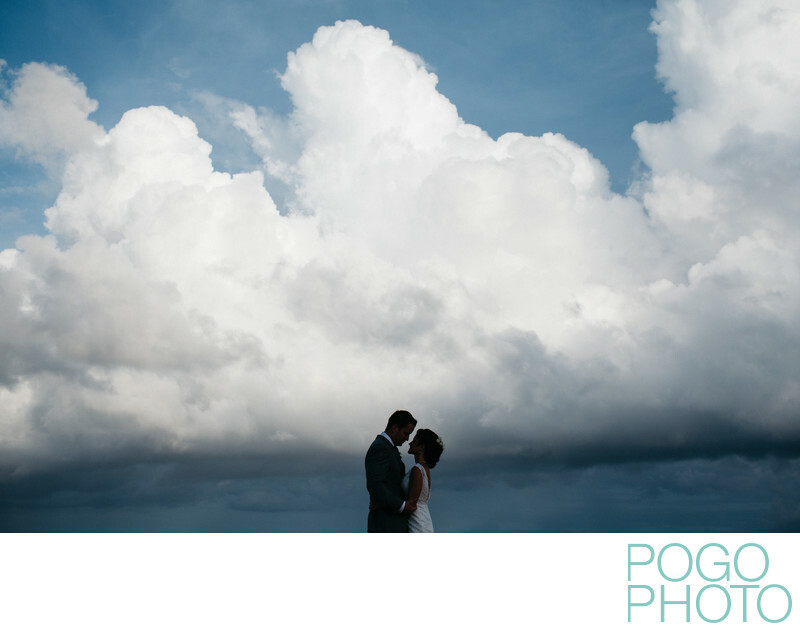 This wedding had brilliant sunlight for most of the day, and was clear for the ceremony; afterward we took the couple a few steps away for some portraits, and a sweeping bank of storm clouds swept across the horizon. Embracing dramatic light to show the environment and capture the feeling of every part of the day is essential; this image could have been lit with off camera flash, but keeping the couple in near silhouette heightens the drama and mystery of the image. The cropping, purposefully omitting the horizon line, keeps the viewer wondering about the location; are they standing on the ground or on the top of a tall building? Or floating through the turbulent skies? Venues like the Hilton Singer Island are ideal for a wedding that has an outdoor feeling while still being well protected from the elements; they have an outdoor permanently tented space with roll down plastic curtains, which provide peace of mine and protection from the elements should they choose to show up to the wedding. Compositionally placing the couple in the lower center quadrant makes the sky loom even larger; the center tower of clouds mirrors their position below, with the dark line of storm clouds and the rising winds ominously coloring the image. Keeping their heads above the storm cloud line visually represents keeping their heads either above water or in the clouds, depending on perspective. The silhouetted darkness combined with the bright clouds in the background make for an arresting image, and one that will be remembered for years to come. Location: Hilton Singer Island, 3700 North Ocean Drive, Riviera Beach, Florida 33404. 1/2500; f/4.0; ISO 200; 35.0 mm.